Many many years ago, I found this recipe on the internet. I made it once and fell in love. Mutter Paneer, my favourite Indian curry. 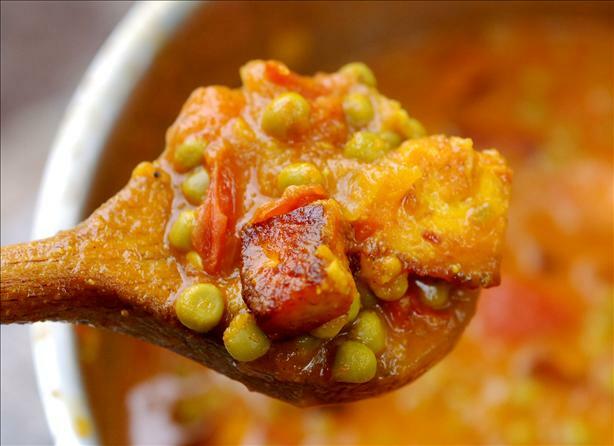 Mutter Paneer (sometimes also called Matar Paneer) is a vegetarian curry from northern India. I love it for many reasons. The ingredients are fairly easy to find and it’s quick to make. For the time you put into the recipe, the flavour is incredible. Over the years I’ve tweaked the recipe, although my version is largely faithful to the original. For me, it’s the ultimate Indian curry. Serve it with rice or with naan bread. One last note: if you can’t find paneer cheese, you can make your own. Look up a recipe on the internet. It’s a fairly simple cheese to make. The other option is to substitute halloumi cheese. This isn’t ideal (halloumi is harder than paneer) but will do in a pinch. Put a little bit of oil in a deep, heavy bottomed frying pan. Brown the cheese, turning frequently so no sides burn. When it is browned, set aside on a plate. Add a little more oil to the pan and throw in the onions. Let them fry until golden, then add the garlic and spices. Fry some more for a couple minutes, then add the tin of tomatoes and about 1/2 cup of water. Let simmer for about five minutes, then put in the fried cheese and peas and simmer covered over a low heat for about 20 minutes. Check the consistency and simmer some more if needed to bring it down to a thickness you like. it looks very delicious. You can make a gravy by blending all the spices and tomato & fried tomatoes. Also add crushed dry fenugreek leaves at end to make it restaurant style.